"Tapetology" is a derived from the combination of a Latin word for carpet and a Greek word for study. Perhaps it will lend some panache to those wacky eccentrics we currently know as "Rug Nuts". I became interested in oriental rugs many years ago when I replaced the wall-to-wall carpeting in my house. I received quite a miseducation through well-meaning but uninformed interior designers and rug showroom sales staff. Frustrated by the lack of information for consumers who wanted a good overview to help them make an informed purchasing decision, I decided to write my own. It's my hope that others will benefit from my experiences as a consumer, and later as a collector and then a dealer. First, let's define what we mean when we say "oriental rug". Most retail rug dealers, and some collectors, make a distinction between "rug" and "carpet" based on a somewhat arbitrary size, roughly anything over 6' x 9'. For purposes of definition I use the term to describe a hand-woven item produced primarily in the Near East to Central Asia. Machine-made rugs of any sort are not "oriental rugs" in the established sense, but are more accurately referred to as "oriental-design" rugs (and, for retail purposes, there's a U.S. law stating that this must be so). So that's distinction number one. Within the definition of handmade oriental rugs, there is also a distinction between decorative rugs and collectible rugs, though there can be some overlap depending on whom you talk to. Decorative rugs are what you'll find most of in any department store or retail rug shop, and they are what most people today mean by the term "oriental rug." Modern decorative rugs are, in the main, produced in commercial workshops (though they are made by hand and hence "genuine" orientals) in Turkey, Pakistan, Afghanistan, Iran, India, and China. The labels on many of these rugs are a study in confusion at least in an ethnographic sense and are often described according to the Persian (Iranian) city which the rug's design attempts to typify. For example, a rug labeled "Sino-Kashan" would describe a Chinese-made copy of a Persian floral medallion carpet as popularized by the city workshops of Kashan, Iran. On the plus side, these mainstream decorative rugs can be beautiful and wear well--certainly much better than machine-made carpeting. However, these rugs aren't likely to appreciate in value, no matter what some enterprising young salesperson tells you. 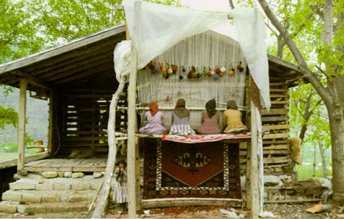 Collectibility and value have much to do with quality of materials (machine- vs. hand-spun wool), dyes (natural vs. synthetic), and the ethnographic authenticity of the rug and its weaver(s); most rugs in upscale department stores or interior design shops are made in commercial factories using chemically-dyed wool in non-traditional colors reflecting modern Western tastes. In many cases, the designs and techniques that developed over time and have given oriental rugs their historic value and mystique have been compromised for the sake of mass appeal. The commercial workshops of India, Pakistan, et al arose in part to help fill the U.S. market demand for handmade orientals when a decades-long embargo made Persian (Iranian) rugs almost unobtainable. The embargo turned out to be a blessing in disguise for the carpet industry, because concerns about quality and the degeneration of the art resulted in a renaissance in new rug production: Alongside the rigid and mechanical production of Persian copies which is still unfortunately the majority, there exists a small but growing percentage of authentically beautiful and innovative pieces which will please the most discriminating aesthete or rug enthusiast. The best new carpets are cottage-industry pieces colored with natural dyes, in designs and colors associated with the weavers' ancestry and heritage. This quality is not easy to find, but the rediscovery-of-heritage ethnographic-authenticity movement has been steadily gaining ground for the past twenty years, thanks in large part to pioneers like George Jevremovic, Chris Walters, and Harald Boehmer. Granted, if your Sino-Kashan lasts 100 years in good condition it may be worth something then, because it is handmade... but it's not likely to have appreciated as an objet d'art. However, for about the same $3500 you'd pay for a Chinese factory product, you could buy a well-drawn, truly artistic rug made with natural dyes and hand-spun wool if you know where to look and what to ask for. I think that's a much better way to spend your money. But I'll bet it won't match your sofa. There are probably as many ways of categorizing rugs as there are people who do it. Rugs are often categorized by their village of origin, but this can be bewildering since so many different styles and types of manufacture can be found in a given area, and some villages don't do any weaving at all but merely serve as a commercial outlet for neighboring regions. Rugs can also be categorized by design, as illustrated by P.R.J. Ford and others, but this is often more confusing than enlightening since there was so much design migration and artistic cross-pollination throughout the Rug Belt. Historically, oriental rugs have been divided into five basic ethnic/geographic categories: Turkish, Caucasian, Persian, Turkmen, and Chinese (from Turkey, the Caucasus, Iran, Central Asia, and China respectively). I personally lobby for the addition of the rugs of Kurdistan as a sixth category. Within these broad categories, rugs are often identified by the names of the city or town of origin (Kerman, Kuba, Daghestan), by broad ethnic or tribal weaving groups (Qashqa'i, Kurd, Baluch), and sometimes by very specific tribal groups (Shahsevan, Afshar). Rugs can also be named according to their function, such as the asmalyk ("hanging") or yastik ("pillow"), or by their design motif such as hatchli ("with a cross"). Thoroughly confused yet? Weavings of nomadic and semi-nomadic peoples, made in traditional designs for traditional uses, primarily for the individual and her family. Designs are executed from memory, often consisting of repeated motifs. These rugs are constructed on horizontal looms and thus are limited in size. Village or "cottage industry" weavings of settled peoples, made in traditional designs which may be done from memory or from a prescribed design. Cottage industry weavings often show a degree of innovation and creativity not found in tribal weavings. The ability to use a larger vertical loom also increases the range of sizes found in village pieces. Workshop carpets, made in both traditional and commercially appealing designs using a written pattern or "cartoon", designed for maximum marketability in the West. Rugs, as both functional and decorative art, have been around for millennia, but surviving examples of early rugs are few. The earliest knotted carpet, known as the Pazyryk or Altai rug, dates to the fifth century B.C. and was discovered by Soviet archaeologist S.I. Rudenko in 1949. Art and archaeology owe many thanks to a group of enterprising grave-robbers in the Altai mountains on the Siberian- Mongolian border. The Pazyryk rug was found in the burial chamber of a local chieftain that had flooded and subsequently frozen solid after thieves plundered the grave shortly after the burial (thankfully, they left the rug behind). The Pazyryk carpet measures roughly 6' x 5' and is of unknown origin, although nutty and esoteric theories abound. Some rug fragments from the third, sixth, and eleventh centuries survive, but there is no real continuity apparent between them. The Crusaders of the eleventh century brought many rugs back from the middle east and were probably responsible for introducing oriental rugs to Europe. 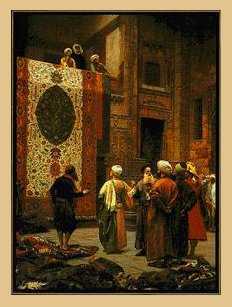 We can trace the historicity of Turkish rugs from about the fourteenth century, and Persian rugs from the sixteenth. Most of our knowledge about these rugs comes from their depiction in paintings of the early Renaissance, where they are often shown under the feet of Christ and the Virgin Mary, and in later portraits of prominent and wealthy Europeans. Oriental rugs have been traditional symbols of holiness and royalty, due both to their cost and their rarity. In a somewhat ironic turn of events, oriental rugs (products of the "heathen" Islamic world) were acceptable for adornment of Protestant churches, even though John Calvin eschewed icons, paintings, and stained glass. Carpet weaving as an art peaked in royal court workshops in Timurid and Safavid, Istanbul, Dehli and Agra, under the patronage of the Persian Safavid dynasty, the Turkish Ottoman Empire, and the Indian Moghul dynasty, respectively. These court designs benefited from a great degree of artistic cross-pollination, and some of the hottest debates in the rug world today are over attribution of rugs of the period, particularly between the designs of Persia and India. Developing in parallel with urban weaving centers, nomadic and village weavers continued their centuries-old craft of knotted rugs. Influenced by court carpets, but restrained by both tradition and function, these tribal and village weavers began a process of adaptation and stylization while retaining their distinctive flavor. In the late seventeenth century, oriental rugs made their way to the American colonies with wealthy families who settled there. In the eighteenth century, Oriental rugs were first used on floors in addition to their use as table coverings and wall hangings. The rise of the middle classes in the mid-nineteenth century fostered a growing interest in knotted carpets, especially after the various World's Fairs showcased eastern cultures and decorative arts. It was in Europe in the nineteenth century that oriental rugs were first studied by scholars. The majority of oriental rugs available today are products of the nineteenth and twentieth centuries. After the second half of the nineteenth century, new materials and dye processes were initiated to speed up the production of rug making in order to meet the demands of western markets. Although the methods of production have become more organized and standardized, many aspects of weaving have remained unchanged to this day. I thought this section should start like the famous French recipe for Rabbit Stew: "First, catch rabbit." The Traditional Method. First, shear a sheep. Wrestle the critter, which outweighs you, down to the ground and denude her of her pelt. Maybe shear a camel and a goat or two, just for variety. Then, after you've recovered, wash the fleece to get the dirt, twigs, and eight-legged squatters out, then painstakingly card and comb the mess so that you have have clean, long, fleecy fibers to spin into yarn. Next, take your handy drop spindle and begin to spin the fleece into yarn. (It helps if you can do this while simultaneously watching children and directing the dinner traffic around the yurt.) When, after many days of this activity, you've accumulated enough yarn, then start the process of plying the spun yarns together. When you're done, cook up a nice batch of dried roots, pulverized flowers, dead bugs, or whatever you're using to make your dye bath, and soak your yarn in each concoction until it achieves the desired colors. Voila! The basic materials. Now for the fun part. After setting up your warp threads on the loom (horizontal and portable if you're on the move; vertical and more or less permanent if you have the space), you're ready to begin tying your knots onto the foundation. Using design motifs carried in your head, wrap the yarns around a pair of warp threads. Do this in a horizontal line, knot by knot, until you've gone across the entire width of the foundation. Then take your weft yarn, making a pass or two after the row of knots, beat the little suckers down, and begin the next row of pile knots. Continue this process, making hundredsno, thousandsof little knots, and at some point in the process you'll see that you're making a rug. The Modern Method. Go to the souk and purchase the dyed wool you need for your project, or obtain the goods from your workshop supervisor. Paying close attention to the cartoon or the chanted talim, make row after tedious row of knots. Produce slight variations on the same designs in complementary colors to sell at Macy's in matched sets. Okay. All levity aside, there are beautiful rugs made with both methods. Neither method is superior in terms of quality or durability; it's the artistic and ethnographic authenticity that are in question. Quality is more objective, but beauty is, more often than not, in the eye of the beholder. It all depends on what you're looking for.